A well crafted instrument with an excellent sound. 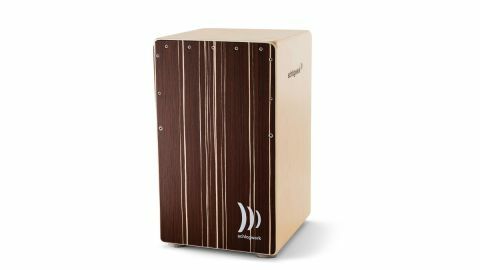 Since producing its first Cajon nearly 30 years ago in 1986, these German percussion makers have been at the forefront of the development and increased popularity of the instrument over the years. Here, we take a look at the brand new pro-level Agile cajon. The cajon measures in at 30cm x 30cm x 50cm, features an eight-ply birch construction and is finished in a smooth, natural satin with rounded top edges. It sports a 12cm port hole on the rear, a non-slip sitting surface and engraved Schlagwerk logos on each side. To increase snare sensitivity, the top third of the playing surface has been secured with small screws while the bottom is glued in place. This also makes it possible to further adjust the tonal response by experimenting with the screw tension, although Schlagwerk recommends they stay in factory position. The aptly named 'Agile String Technology' features horizontal strings which can be tightened toward or loosened away from the tapa using a control at either end. A central knob is then used to adjust the tension of the strings and thusly, manage snare dampening. We would be as happy with this as a piece of furniture at home as we would be rocking it on stage. The less boomy nature of the Agile Pro offers a more percussive quality than lower-end cajons, complemented by the ability to completely dampen the snare wires for a traditional cajon sound. Further experimentation with the strings provides a more sensitive snare response that allows a more subtle approach to the instrument.